We’re excited to announce that on Monday, October 22nd, we are moving our Lexington East, Kentucky allergy office to a new location. 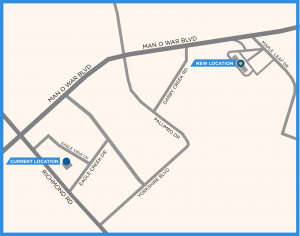 Our new office is located just down the road in the Andover Shoppes. The new office will continue to serve patients with allergies and asthma in Lexington and the surrounding areas of Fayette County in Kentucky. Drs. Arora, Dyer, and Warrier will continue to see patients at our new office. If you have an existing appointment on or after October 22nd we have already moved your appointment to our new location. Our 3292 Eagle View Lane office will remain open for appointments and allergy shots through Friday, October 19th. Our shot hours and phone number will not changed. If you have any questions, please call 859.263.1900 for more information.